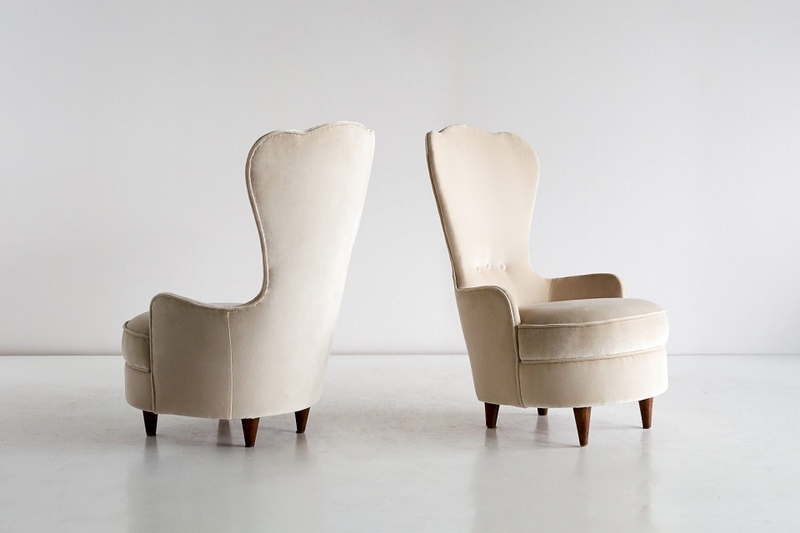 This bijou pair of chairs was designed by Paolo Buffa in the mid-1940s. The unique slipper chairs were part of a bedroom entirely designed by Paolo Buffa. Like most of Buffa’s chair designs, they were produced in Cantù, close to the Como Lake. The chairs and footrest stand on oak legs and are upholstered in a light beige velvet fabric. The set is accompanied by a signed certificate of authenticity from the Paolo Buffa archives. Biography: After working briefly in Gio Ponti’s studio in the 1920s, Milanese architect and designer Paolo Buffa (1903-1970) quickly made a name for himself amongst the Milanese upper classes. His designs are original, beautifully executed and highly refined, combining the classical with the functional and modern. Executed in only the most valuable materials, his designs are infused with Lombardy’s woodworking traditions. These characteristics make Buffa’s work highly collectable.